Stephenson is reputed to have been a cautious and conservative man, who lost sleep worrying about the progress of his works and was always reluctant to procede without thorough planning and investigation. When called upon, he was also a clear and eloquent speaker, and these qualities in combination made him a powerful advocate. He was on the winning side of both the major railway-related debates of his day  the so-called Battle of the Gauges and the challenge of the atmospheric system. The use of atmospheric over locomotive power was rejected by Parliament in 1845, while the narrow guage (4 ft 8 1/2 ins) used by the Stephensons was standardised by an Act of 1846. Nonetheless, Stephenson remained on good personal terms with his rival, Brunel, who lost in both debates. 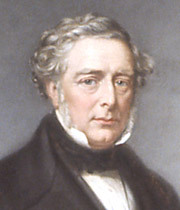 In 1847, Stephenson became Conservative MP for Whitby and remained so until his death  he was re-elected twice. He had found time to marry in June 1829 in the midst of developing the Rocket, but never had children. His wife  named Frances like his mother  died on 4 October 1842, aged 39. Christian names were in short supply generally in the Stephenson family. Robert, named after his grandfather, had an uncle named Robert (George's brother) whose son, Robert's cousin, was called George Robert Stephenson. Both uncle and cousin were engineers too  George Robert became head of Robert Stephenson & Company in 1834 and outlived his more famous cousin by many years. Stephenson's health was rather poor throughout his life and in 1859 he was advised to stop work altogether and take a holiday. In September he set off to go yachting in Norway (it was his only hobby) but had to return home hastily within weeks. He died in his home on 12 October 1859. He was a popular figure and his death is reported to have brought about something like national mourning. Crowds lined the route of his coffin as it was brought to Westminster Abbey on 22 October for its internment.